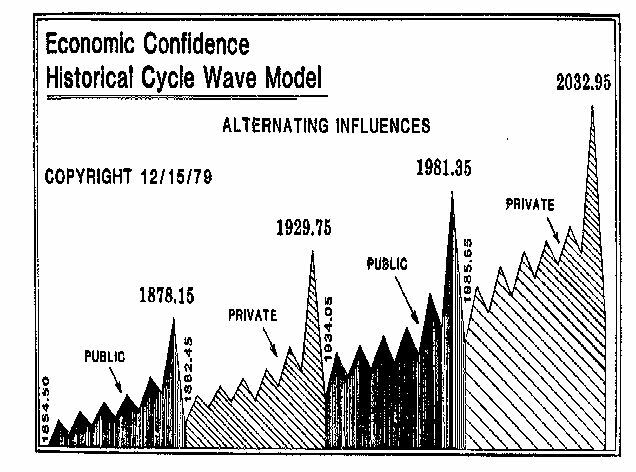 Could you please explain the difference between the 8.6 year peaks in the ECM cycle within the public or private wave and the 8.6 year peak at exactly the stage that it switches to the public from private wave and visa versa. Is the difference monumental or a subtle difference. ANSWER: When these waves shift from Public and Private, the key is where does CONFIDENCE reside. Who do you trust? Government or the Private Sector? A Private Wave is where volatility is the highest and private sector assets do best. This is where we see government become more aggressive because they tend to lose control. The March of Washington led by Coxley took place during the Panic of 1893. This was a Private Wave. The culmination of that was the 1929 Bubble. We see Roosevelt’s New Deal start 1934. That culminated in the peak in interest rates precisely to the target in 1981. Ever since we began this wave in 1985, that is when government formed G5 (now G20) and it will continue to get more aggressive as CONFIDENCE shifts from Public to Private. This typically marks defaults in government debt and rising private sector asset values.